Even though I should have no trouble photographing this one, this is all I can show to you of the new project I’m testing until it’s published. Remember when I decided to start testing patterns late last year? No, me neither. Maybe I was taken over by a walk-in. 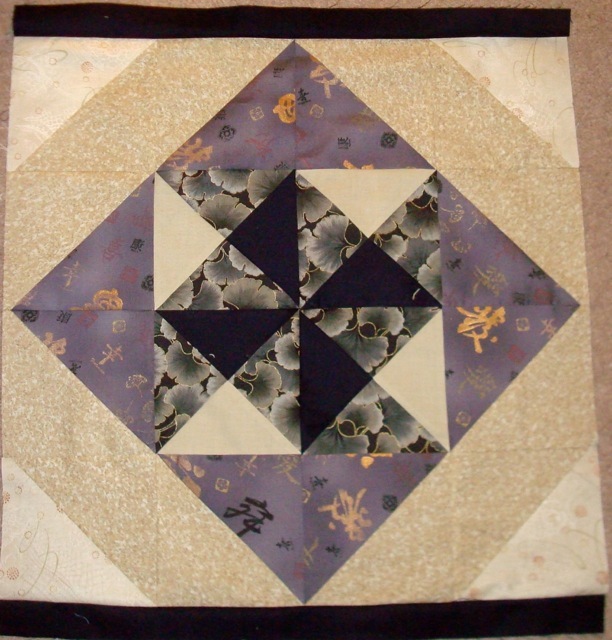 In reality, the reason that I decided to, even with an admission that I don’t like to make “other people’s quilts,” was that I was hoping it would hone both my writing skills and my sewing skills. I think my fourth Aiming for Accuracy block might have come out too light. I also decided to experiment using some things I’ve always meant to try (or return to.) My success was limited. I do not get along with Madeira metallic thread. It goobers up by my machine. (Luckily, once I changed to a fatter needle, all the goobers were on the back and this is a pillow sham, so no one will see that part.) I’m sure there’s a way to make it work more nicely, but it’s never going to be my go-to thread. 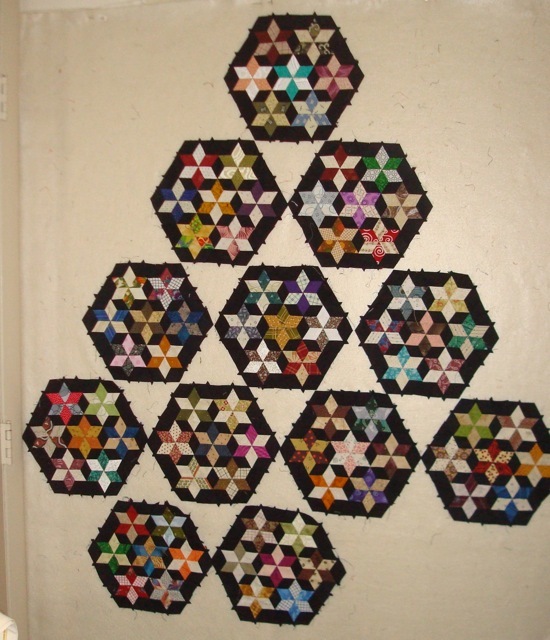 The Seven Sisters blocks in Stars For Malcolm, will be arranged in a diamond…I think. 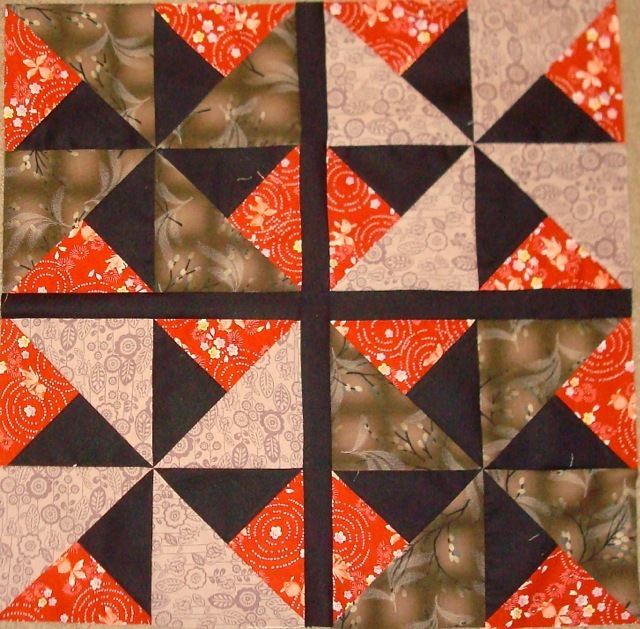 Other Projects: I have completed sewing the Grandmother’s Choice blocks into a top, but I haven’t photographed it yet. I think this is because I am not sure about a border. I seem to lean towards the most complex borders imaginable, but, really, this is a block-of-the-month and not my original design. Shouldn’t I make it easier on myself? No progress at all on Xmas Dear Jane. I haven’t looked at it at all. 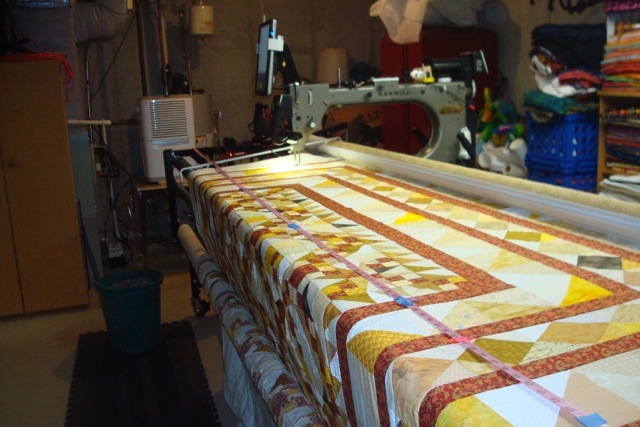 Maybe having quilted the pillow sham pattern I’m testing, I’ll suddenly feel inspired to machine quilt it. I’m not holding my breath. The Quilt That Shall Remain Nameless finally emerges from the closet. This year has been a long, creatively fruitful, “dry” spell for me. “Creatively fruitful” because I’ve started a boatload of projects simply because I’ve been inspired to try, to understand, to play, or to write. Well, the Big News in this post is that I actually have finished a quilt. It is the dreaded Quilt That Shall Remain Nameless. 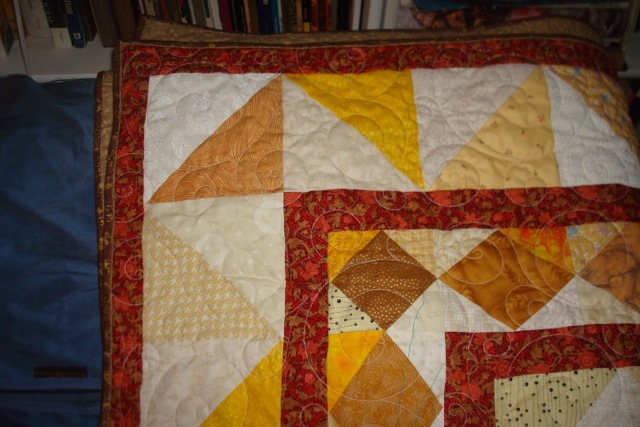 The pattern is one that I started testing back in December for The Quilt Pattern Magazine which is an e-magazine (i.e. published online only.) It was published in May (although I didn’t realize it until July) and called Freedom’s Colors. I guess, since in my past posts I whined about this pattern, I should mention that the biggest problem I had with it was that it was organized in a different way than I usually work. Testing patterns means working it exactly as specified by the designer/author and I found that difficult. The actually sewing wasn’t too bad, and I really like the design of the center, but the borders are too fussy for me. I quilted it on Cricket and Jeff’s long arm (a.k.a. The Beast) with their new Statler Stitcher, Einstein. With the learning curve (and re-learning curve because I haven’t used the long arm in over 6 months) the quilt took 2 days (8 hours + 6 hours) to quilt. At first, I was unsure about the pantograph I chose, but, in the end, I really like it. 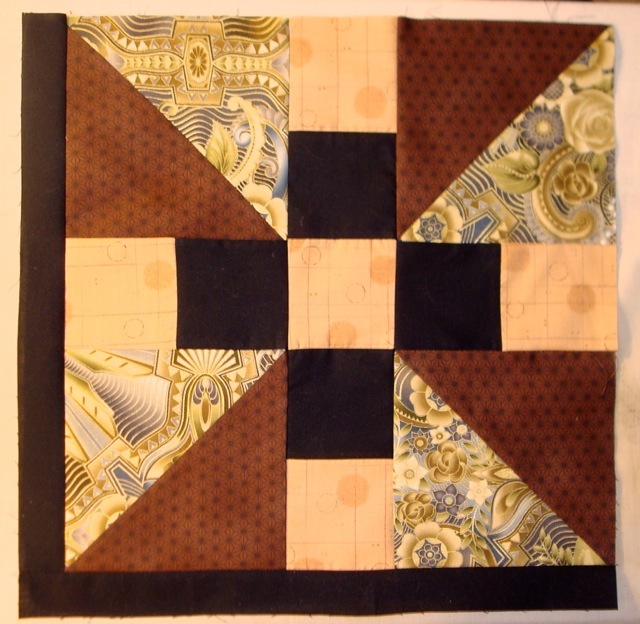 Its curvy swirls are perfect for the fussy straight lines of the piecing, and the quilt itself didn’t suffer from being quilted totally with a pantograph even though there are 8 borders I could have quilted individually. My other projects: I’ve finished sashing the individual blocks of Grandmother’s Choice and have started putting them together into a top. I suspect that I will use another all-over pantograph on this when it’s done since The Quilt That Shall Remain Nameless turned out so well. 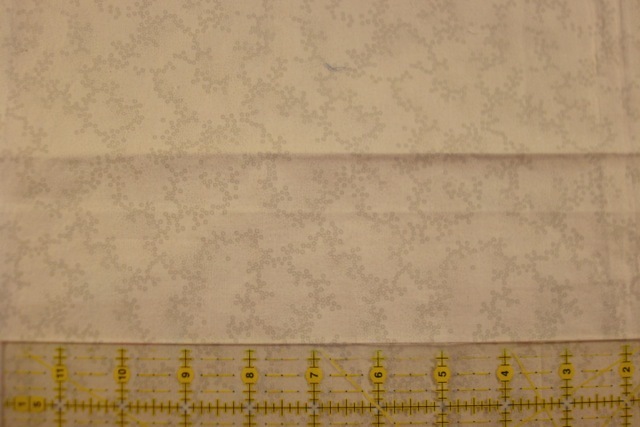 I’m cutting fabrics for the next block in Aiming for Accuracy, and sewing the blocks together for Grandmother’s Choice. This leaves me actively working on two of the five projects left from the list of seven I named as priority projects in June. So, progress. …And there was great rejoicing. 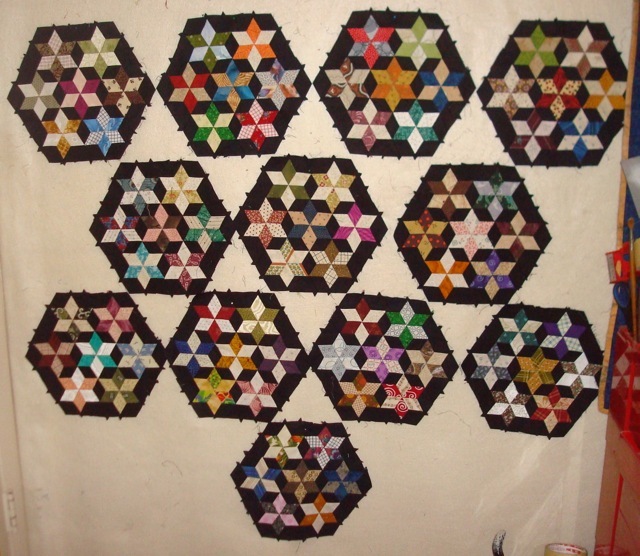 Up to 12 Hexagons on Stars for Malcolm. Not much is happening around here. Well, not much quilting is happening either. I did (finally!) get my container garden (mostly) finished. 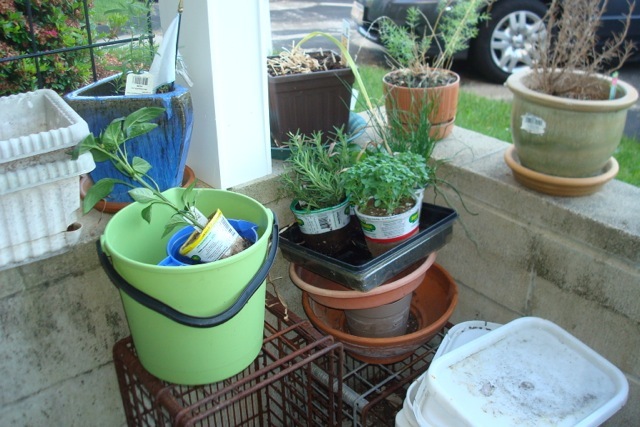 I am trying to grow cilantro from seed without it bolting again this year, but all the other plants were bought. (Well, except for the morning glories… they come up every year now. Probably will still be looking for my trellis long after I’ve moved into the old age home. Sadly, I am running out of this lovely grey fabric and I can’t find any more, so I’m using another fabric in addition to sash the “grey” blocks in Grandmother’s Choice. I’m actually happy to be making some (small) progress on some of my other projects as well. I have about a third of Grandmother’s Choice sashed. I ran out of the light grey fabric I was using and bought a different one use as well. I hope it looks okay, but I won’t really know until I’ve got more of the “substitute” grey sashing done. I did, however, jump on that brown 108″ backing fabric I found in the clearance rack for 50% off. I don’t know I could have gotten it for less than $4/yard anywhere. Just happened to be at the right place at the right time. I don’t even think I actually have this print, either, but I was contemplating buying it at one point. So, even though I have a “fabric tragedy,” with the grey, I’ve had a “fabric miracle” to balance it out. I have been keeping up with Aiming for Accuracy. The third block was supposed to be posted today, but I haven’t seen it, so, obviously I haven’t made it yet. Putting my porch garden together. The second Aiming for Accuracy block. I really haven’t done much since my last post. It’s been hot and humid, making me cranky as all get-out. I did manage to sew up the second Aiming for Accuracy block. The photo didn’t come out quite right since the tan squares are slightly more “orange-y” than they appear. The dark brown print and the black are not Japanese prints. The black is just solid Kona black and the brown is something I bought as binding for Sunflower Lattice. I hope I leave enough to do that! Of the two Japanese prints, I was most worried about the metallic one. It’s a HUGE print and I only got a Fat Quarter. I love it and will miss it when it’s gone, so I had to struggle to cut it up and use it. Anyway, I’m working on a bunch of space-hogging projects at the moment. 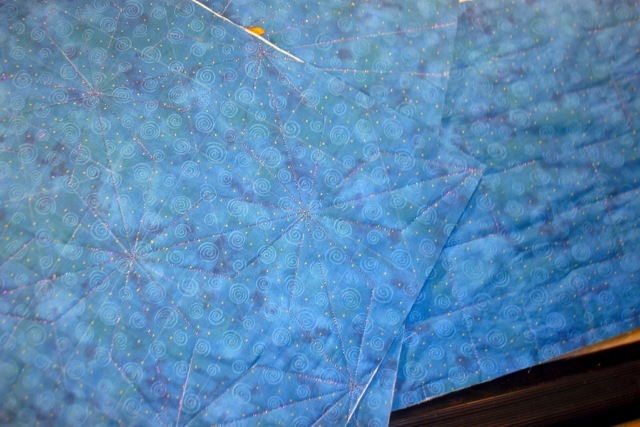 Between doing the sashing on Grandmother’s Choice, setting the light table up to finish marking the quilting motifs for the Xmas DJ, I have no room to store the larger blocks for Aiming for Accuracy. 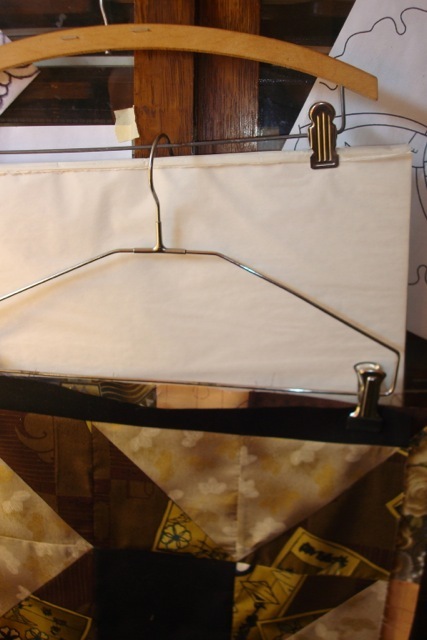 This is the solution I came up with: skirt hangers! I started hanging my drafting pad on one when I was working on Big Wheels. This kept it out of the “normal” clutter of all my drawing pads and near my sewing machine/drafting table. I also use them to clip fabrics and patterns for clothes I intend to make. They hang up on the flat file near my drafting table, and. since the hook part swivels, I don’t even have to keep the doors of my flat file open. 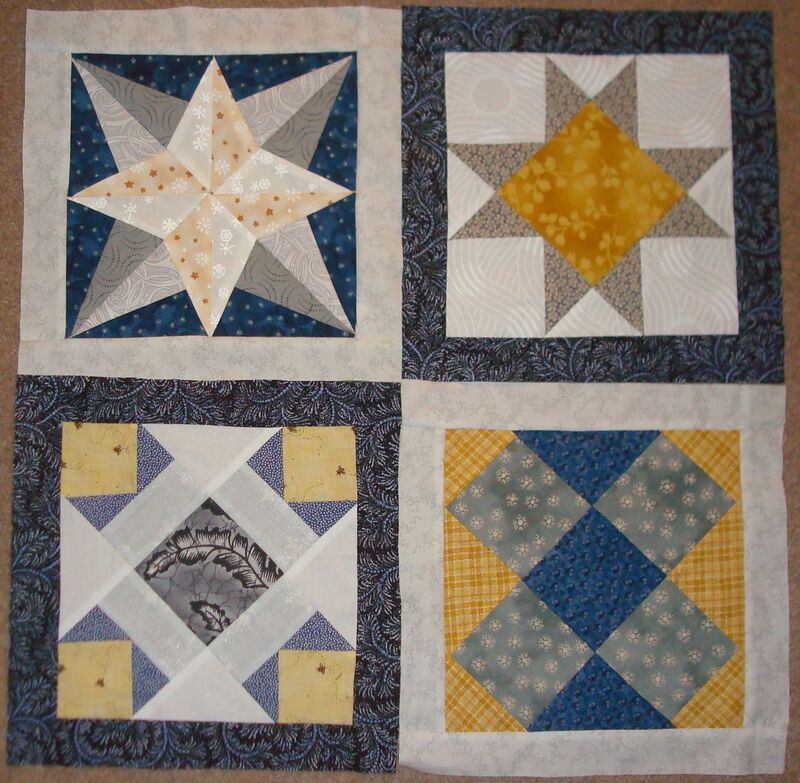 Grandmother’s Choice blocks with sashing. Any garment sewing projects still need to be hanging on their own because of the length of the fabric, but until I have more blocks (or I finish the sashing for Grandmother’s Choice and I hang them up on the design wall), this is the way I’ll be storing them.